On Wednesday April 5, HTC Vive will be celebrating its first anniversary with ‘Vive Day’ – which will see a number of discounts on the popular virtual reality headset's hardware and software. The day will also mark the launch of the Viveport Subscription service, which offers HTC Vive owners a Netflix-like experience. For a monthly subscription of £6.99/$6.99/AU$9.99 you can choose five virtual reality apps or games from a curated list to download and install. You’ll have unlimited access to the apps you select, or you can swap them each month to try something new. If you find an app or game you want to keep outright, you can buy the app as well. When we spoke to Steiber he explained how getting people to experience virtual reality, and the various applications it can be used for, is essential to maintaining the technology's success – and that the Viveport Subscription service is a good move for ensuring this. 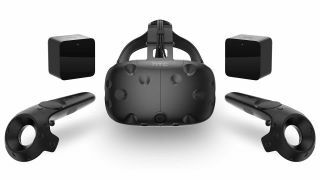 HTC Vive has also lined up some other gifts for Vive Day, with £100 ($100, around AU$130) being knocked off the asking price of the HTC Vive headset. Also on April 5, HTC Vive will make its VR action game Arcade Saga available to download and keep for free. This game, which includes a number of games based on pinball, table tennis and archery, features boss battles and online multiplayer, and is usually sold for £14.99 ($14.99, around AU$19). It’s nice to see HTC Vive mark its first anniversary with offers that benefit existing owners, while tempting potential newcomers to VR , and the Viveport subscription service could prove a key differentiator between the HTC Vive and its competitors.